it all started a few weeks ago. i got a sudden urge to change my hair. i thought that i should go blonde for the summer. i thought it would be easy. i thought it would look cool. i thought it wouldn’t be such a great shock. i thought wrong. now my hair is pretty funky already so i really can’t tell you what made me think it needed some sort of shaking up. the top half of my hair is red. the bottom is dark brown/black. two tone is the best way to describe it, but since the red is pretty deep ruby and the black isn’t a true black, it worked. i liked it. my friends liked it. the people at work liked it. so why change it? I DON’T KNOW! last week i asked a friend of mine if she would help me to replace all the red with blonde and she agreed to. now i’ve coloured my hair many MANY times before so i knew what i was setting myself up for. hours and hours of bleaching and toning and praying that my hair wouldn’t fall right out in clumps from all the processing, but i couldn’t seem to stop myself. even when i woke up this morning to meet with my friend to buy supplies and head for her house to get started the little voice of doubt was there. “don’t bleach it. why not just cut it? don’t bleach it!” all signs pointed to bad idea. did i listen? NO. i did it anyway. the result? well… just take a gander at the picture above. it pretty much says it all. 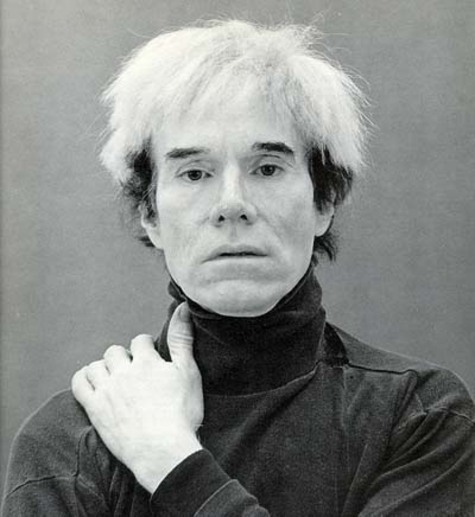 being an artist myself, i’ve always admired andy warhol… but that doesn’t mean i want to look like him! ‹ life. don’t talk to me about life.